Cape Neddick Lighthouse (also known as Nubble Light) in York, Maine. Mark Twain, always the master of the witty quip, spent time in The Yorks. To paraphrase a famous quote, he said you couldn’t toss a brick in any direction without it hitting a postmaster. For those who have never been to southern Maine, this comment might seem obscure. It is only when you realize The Yorks are divided into coastal villages does Twain’s jab hit home. The Yorks are comprised of York Beach, York Village and York Harbor. Once you add Kittery and Cape Neddick to the seaside mix, you end up with a lot of postmasters. York Beach has an invigorating and carnival-like atmosphere. While there are cottages, motels and resorts, York Beach has less of a resort feel and is more of a throwback to boardwalk style beach recreation. Think of it as a northern, light beer version of places like Ocean City, Maryland or Rehoboth Beach. It is a fun, family-centric holiday destination. There is saltwater taffy, the Fun-O-Rama Arcade, bowling, indoor mini golf and no shortage of colorful T-shirt shops. In other words, while you are relaxing on Short Sand Beach (get there early because space is at a premium in the summer) your kids can be occupying their endless summer days with all sorts of carefree amusements and novelties. 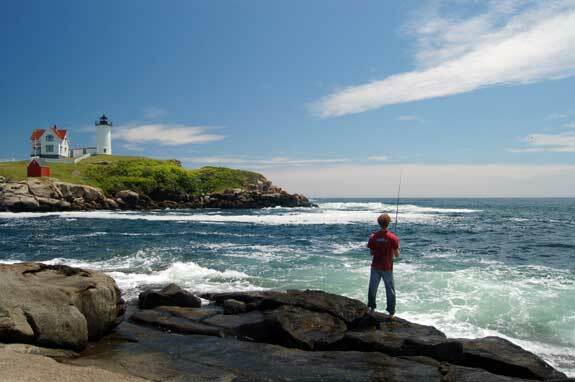 York’s Wild Kingdom, the Nubble Lighthouse and The Goldenrod are York Beach’s top attractions. Part zoo, part amusement park, York’s Wild Kingdom is home to a variety of exotic animals. The white Bengal tiger is the highlight. Paddleboats, whirl-a-twirl rides and elephant shows will have your kids screaming with glee. Next up: Drive to Sohier Park on Cape Neddick and take your turn photographing one of the most photographed lighthouses on the planet. Built in 1879, the Nubble Light (or Cape Neddick Light) is still in use today. York Beach is famous for its taffy, so there is no better way to top off your day on the coast than by stopping at The Goldenrod for some Goldenrod Kisses. This classic institution has been making taffy since 1896. York Village may as well be on a different continent than York Beach. If York Beach is a summer starlet, then York Village is a debutante. Founded in 1640, York Village and nearby Kittery are continually at odds over which town is Maine’s earliest settled community. York Village has 50 buildings on the National Register of Historic Places. From the York Gaol and the Old Schoolhouse to the Emerson Wilcox House and the Perkins House, most of the historic district can be found on York Street and Lindsay Road. In classic New England fashion, the Old York Burying Ground is said to be haunted. If you are looking for a less spooky, more mainstream destination, head to Stonewall Kitchen. York is the headquarters for the gourmet jam, jelly and chutney company. York Harbor is the moneyed, exclusive extension of York Village and nothing like its wilder little sister, York Beach. Picturesque mansions sit atop manicured, oceanfront lawns. When you drive the coastal lane, you cannot help but think of old money, backyard croquet games and yacht races. It is formal, staid and quiet. The harbor is filled with old lobster boats and pleasure craft, and the Harbor Beach is a good place to swim, if you can bare the chilly temperature. Looking for a place to stay? The York Harbor Inn, a 17th century fishing cabin turned sprawling B&B, has stunning ocean views and antique period details. Beachcombing, hiking, biking and kayaking are popular activities in York Harbor. The Shore Walk is a relaxing afternoon stroll, and it will bring you across Wiggly Bridge, which is one of the areas most prominent landmarks. The 2-mile Brave Boat Harbor Trail, in Rachel Carson National Wildlife Refuge, is a prime bird-watching area. York Harbor is dotted with fishing charters as well as kayak and bike rental shops. Kittery is known as the Gateway to Maine. However, its real claim to fame is the 120 stores that make up the factory outlets. Ask anyone about Kittery, chances are they will not know it was one of Maine’s first settlements, has the oldest naval shipyard in the U.S. or once had a vital shipbuilding industry. However, they will certainly know there is a J. Crew and Banana Republic outlet. If you want to escape the hordes that descend on the outlet stores, you can find solace in the Eliots or Kittery Point. The Eliots are old communities (north and south Eliot ) that sit on the Piscataqua River. In Kittery Point, hiking and biking trails prevail as well as unparalleled views of Pepperell Cove. Look across the water and you can see Portsmouth, New Hampshire and the Whaleback Ledge Lighthouse. Visit the following directories to find lodging, dining, attractions, shops, services and recreational activities in the York, Maine area.